PNMT antibody LS-C9665 is an unconjugated guinea pig polyclonal antibody to PNMT from rat and bovine. Validated for IHC. PNMT antibody was raised against phenylethanolamine-N-methyltransferase from bovine adrenal medulla (Sigma). Recognizes PNMT. 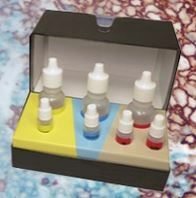 Absorption with 10-100 ug immunogen per ml diluted antiserum abolishes the staining. Species cross-reactivity: Rat. Suitable for use in Immunohistochemistry (frozen and paraffin sections). Immunohistochemistry: 1:400-1:800 (PAP) with overnight incubation at 4?C. Positive control: DEPC-fixed paraffin sections of rat adrenal gland. 50 µl Reconstitute in 100 ul of Sterile 40-50% glycerol, distilled water.